The Seoul Metropolitan Government (SMG) plans to establish an initial platform with an objective of becoming one of the world’s leading e-Government within the next five years. It will be receiving on and offline opinions from 100,000 citizens, and run public hearings and a Council on Informatization Strategies in preparation for “Initial Plans for Digital Seoul 2020.” In doing so, with its vision “Global Digital Seoul 2020 – New Connections, Different Experiences,” SMG has presented four strategies; Social Media-politan City, Diginomic, Digital Social Innovation and Global Digital Leader, along with 54 other future projects. First, Seoul will reinforce civil communication governance by using digital media as its tool. SMG will be increasing the number of businesses run by citizens, experts and enterprises by up to 50% by 2020 in order to satisfy the needs of citizens, who are the actual beneficiaries of the public digital service. Moreover, Seoul will operate programs to foster start-ups related to FinTech; it will discover and foster 30 start-ups while supporting around 330,000 creative talents. G-Valley plans to foster professionals by operating IoT (Internet of things)-specialized academies, Hackathons and conferences. It also aims to develop 243 promising techniques by 2020. Furthermore, SMG plans to solve the urban problems and improve citizens’ quality of life through digital innovation. By designating Bukchon area as its first IoT project location, SMG is set to increase the number of IoT areas by up to 100 areas by 2020 and transform Seoul into a one whole Living Lab. SMG will also deal with parking-related issues by providing real-time information to 550 parking lots by 2020 through an “Integrated Parking Information System.” This system will allow citizens to know the location of parking lots and real-time parking information through Smartphone Applications. 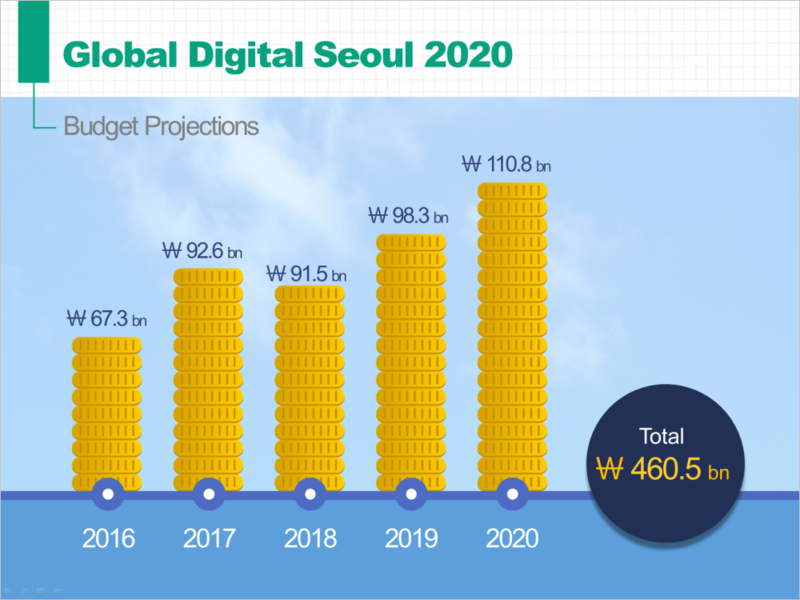 In addition, in order to establish world’s best digital infrastructure, Seoul plans to create free Wifi Zones across all the public areas in Seoul including subways and buses by 2017.